Every now and then, I have a die cut that begs for some embossing powder. 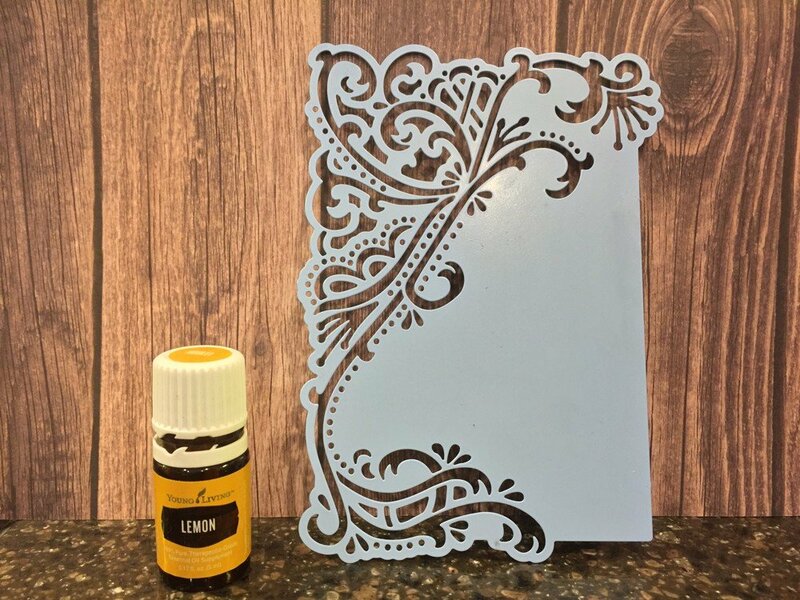 After using my squishy pad to enhance the embossed areas on a die cut, I will sometimes use Versamark ink and some embossing powder to give the piece that extra character. Before taking the die cut piece out of the die, I smoosh a Versamark pad through the embossing openings. Sprinkle with a little embossing powder, heat set, and the piece just has that extra something something. But what to do with that sticky Versamark residue? I’ve tried rubbing it off, scrubbing it off, baby wiping but nothing seems to remove it. Lemon essential oil to the rescue! I suppose Goo Gone might work, but I can’t seem to find my little bottle. And it’s nothing more than citrus oils. I keep lemon oil on hand, adding it to drinking water and iced teas. It also comes in handy to remove Versamark residue as well as other sticky leftovers. I just drop a single drop on the die, rub it around with my fingertip, and then use a baby wipe to scrub it off. Make sure you wash your die with some dish detergent and rinse well before you use it again. I also found that castile soap makes the Versamark residue worse. It made it a gummier mess than if I had just used the oil first. Make sure you also use the oil on the cutting side of the die. When smooshing the Versamark through the openings, some of the ink does leak underneath. Again, don’t forget to clean the die with some dish detergent and rinsing well before using it again. Want more easy tips like this? Be sure to subscribe to get updates on new posts.